Our group went up to the McLennan Lake area again this year to do some portage clearing. After consulting with Ric at Churchill River Canoe Outfitters, we drove up to Bear's Camp at McLennan Lake. After talking with Vince, the proprietor, we arranged for parking and unloaded. At the put in, a pair of solo paddlers were about to start out when one of them approached me after hearing us talking and introduced himself as fellow CCR member, guyfawkes041. We had a brief talk and then they were off. It is always great to actually meet other members. The following report was mostly written by a friend but I added some further information and the maps. Day 1 – Launched at Bear’s Camp on McLennan Lake. Portage (approx. 20 m): Small nameless lake to Davis Lake, very short over rock ledge, well-used, steep on west end, not marked as a portage on the map. Camped: beside the portage on route 26 from Davis to small nameless lake, big campsite with room for more than five tents. On the west side of the isthmus, overlooking the small nameless lake. Shows signs of being well-used, but clean. Day 2 – We left our camp set up and went out to investigate and clear nearby portages. Portage (approx. 250 m): Cushon Bay (Davis Lake) to Fowell Lake, removed lots of burnt deadfall and new-grown brush. This portage showed few signs of recent use, but after being cleared it was in good shape. The south landing is not properly located on the map – it is in the extreme NE end of Cushon Bay. The route follows the east side of the drainage valley. 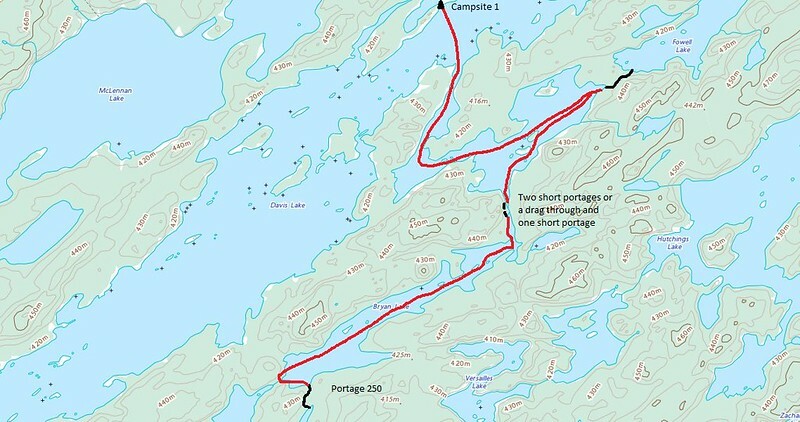 Portage: Cushon Bay to Bryan Lake. Few signs of recent use. This is actually two very short portages with a small pond in the middle. We managed to float/drag the canoes up the short stream to the pond, after some clearing of deadfall from the stream. In lower water years it might not be easy to use the stream. There is a portage route on the south side of this stream, which could be used. The very short portage from the pond to Bryan Lake required some deadfall removal. It is on the south side of the stream. It is very rough, over big boulders and exposed burnt roots. 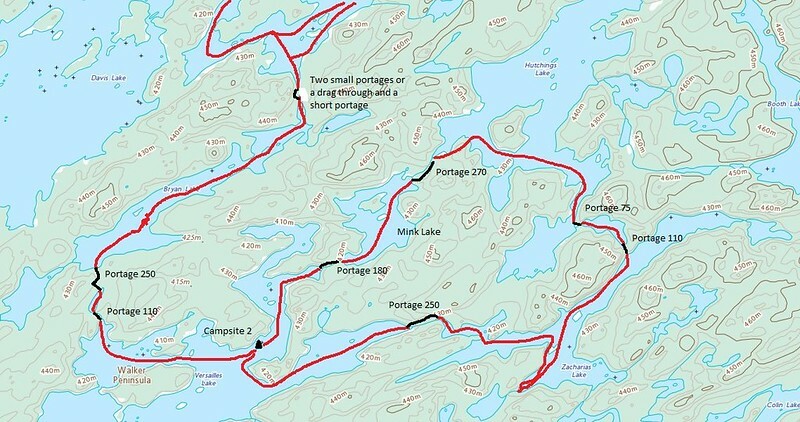 Portage route (potential): SW end of Bryan Lake to small nameless lake (en route to MacLachlan Lake). Scouted, but not cleared. There appears to be a good route on the east side of the drainage, with a little clearing work with a chainsaw. Portage (approx. 250 m): Bryan Lake to small nameless lake (en route to Versailles Lake). Signs of recent use. The standard route goes steeply up and back down over a rocky ridge, then traverses a very wet muskeg (floating sedge with small trees) for 100 meters or more. We cut a new trail from the top of the ridge down to the south landing, mostly through burned small spruce and jackpine. The footing along this new section is good. There is still about 15 meters of very wet muskeg to the south landing, which is on floating sedge. At the end of the day, we returned to camp on Davis Lake. We took down camp with plans to paddle to a known campsite on an island near the east shore about halfway down Versailles Lake near the portage route from Versailles Lake to Gowrie Bay of Colin Lake. To do this we had to go over part of our route from Day 2 – from Davis Lake to Bryan Lake and then from Bryan Lake to a small nameless lake. This last portage was the one we re-routed to avoid a long area of floating sedge. The new route was good but the last section over the floating sedge was not. In future, we might consider either finding a new eastern landing or placing some logs as corduroy to help prevent sinking. Portage (approx. 110 m): small nameless lake to Versailles Lake. Wet north landing. The route is down the drainage, with generally firm footing but with much puddle and stream dodging. There is no obvious alternative route without a lot of work. (After the rain over the next couple of days, it was much wetter and trickier.) In the future, it would likely be worthwhile moving the portage to the south side of the drainage. We had lunch on a small island near the north end of Versailles Lake and liked it so much we decided to camp there. It is beside the mark for the rock paintings in the north end of Versailles Lake and it has a wind sock on it which, I assume, is used by the owners of a nearby cabin. It is a high rocky island that has seen heavy use but was quite clean. There was room for five tents. Once again, we left camp set up and did a day tour to clean portages. Portage (approx. 180 m): Versailles Lake to Mink Lake. Well-used. Cleared some deadfall. Good trail on south half, north half in stream would be wet in higher water. No obvious alternative route without a lot of clearing work. Portage (approx. 275m): Mink Lake to Hutchings Lake. Well-used. Cleared a little deadfall. Mostly good condition, but goes across and then up a dry stream bed for a few meters on the north end, which could be wet in higher water. It might be worthwhile to re-route the northern end to avoid the stream. The next two portages are on the route from Hutchings Lake to Zacharias Lake. Portage (approx. 75 m) : Hutchings Lake to small nameless lake. We re-established the portage trail over rock ledges on the north side of the drainage. A well-used and very wet winter trail follows the drainage. We cut a moderate amount of burnt deadfall, and flagged the route with survey tape. The east landing is on a steeply sloping rock ledge. Portage (approx. 125 m): small nameless lake to Zacharias Lake. Well used. We removed a moderate amount of deadfall and did some brushing. Rough footing over boulders and roots. Portage route (this portage has fallen into disuse after the fire and the resulting tangle of fallen trees. ): Zacharias Lake to small nameless lake (en route to Versailles Lake via three portages). We scouted but didn’t clear this route. We couldn’t find the old north landing south of the cabin site, due to a heavy tangle of deadfall. We did find a landing site against the rock wall on the east side of the bay. A good route would be possible with a little clearing with a chainsaw from that landing along the rock wall for a few meters, then angling west to gain the height of the rocky hill in the middle of the drainage valley, across the top of the hill to the southwest, and finally descending to the south landing via an obvious ramp in the rocky hill. There are signs of the former portage trail on the rocky hill. The south landing would be on the east side of the stream. Portage (approx. 250 m): Zacharias Lake to Versailles Lake, connecting a bay on the extreme west end of Zacharias with a bay on the northeast end of Versailles. We cleared a little deadfall and did considerable brushing. The trail was in generally good condition, but there was a fair sized puddle on the Zacharias end, which was, fortunately, not deep and had a firm bottom. We returned to camp on the small island in the north end of Versailles Lake. Portage (approx. 40 m): Davis Lake to small nameless lake (route 26). Well-used, good condition, no clearing necessary. The Davis Lake end is steep and slippery when wet. Portage (approx. 50 m): small nameless lake to flat water above the cataract. This portage is located on the north side of the cataract coming into the small nameless lake. It is short and showed signs of being well-used, but we cleared a bunch of deadfall from its west end. From there, we paddled up the stream to a low beaver dam (with some shallow, rocky water below it), and dragged over the beaver dam to flat water and McLennan Lake. Evidently there is a portage which by-passes both the cataract and the shallow, rocky section. From the south side, it is located south of the cataract. From the north side it starts about 230 m south of the shallow, rocky section. This map is a different scale than the others. Thanks for the report, and once again thanks to your group for the trail maintenance efforts. I must have just missed you in Missinipe, I stayed there the night of the 9th and put in on Cratty on the morning of the 10th for an 8 day trip. It was definitely a colder and wetter than normal September - the upside was that the weather, while bad, was not as bad as the forecast! 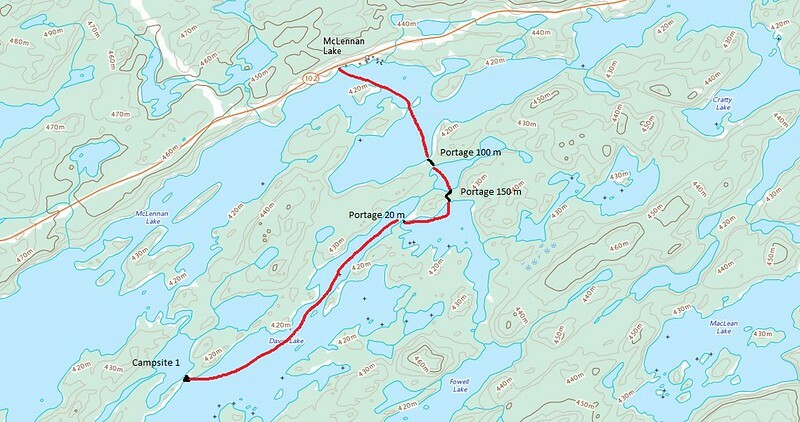 From the second small lake southeast of Liggett Bay (from which you portaged to Davis Lake) there is another portage which goes south to Fowell Lake. It was in good condition, a little wet in the middle, last fall. I found most portages to be wetter than usual this year - maybe that is why you found the trail out of Bryan to the small unnamed lake on the way to Versailles to be so poor. I have been through there a few times, and while it was always boggy at the south end, it was not as bad as you describe. Years ago I paddled that little chain of lakes north from Minuhik through MacLachlan and on to Bryan. 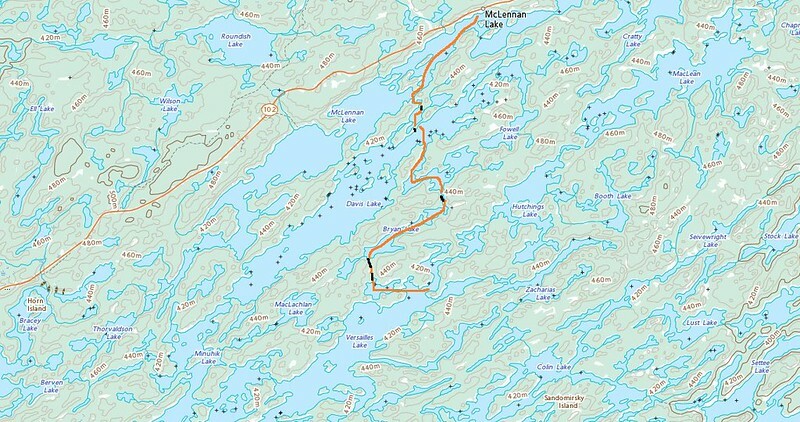 At that time there were reasonable portage trails from Minuhik to MacLachlan, and vestigial trails continuing to Bryan. Again, thanks for the good works. Since the fire in 2015 and last summer's windstorm, the area needs all the friends it can get. Too bad we missed you at Missinipe. It would have been good to hear tales of your many canoe journeys. We didn't go straight into Fowell Lake because we were a large group with 5 tents and weren't sure if there was a campsite there that would be large enough. Ric had given us a map with a number of portages which needed attention but he seemed especially interested in the Bryan Lake area and Zacharias Lake. We knew of the one campsite where we stayed and another possibility just a little way further along Davis Lake from which we could get into Bryan Lake so we chose to go that way. Interesting that you have found the portage from Bryan Lake to the unnamed lake to the south not too bad in the past. It would have been very difficult this year, hence the decision to re-route. Perhaps our work would not be useful most years but it does give paddlers an option for wet years - and it gave us a good workout. Good to know about the route from Bryan Lake southwest. Another year we will likely go through that way and establish and/or re-establish the portages. Maybe we'll meet on the ski trails.